At 6:10 p.m. on August 6, due to a heart failure after 50 minutes of first aid treatment, Rev. Chow Lien-hwa passed away at Cheng Hsin General Hospital. Before he was sent to the emergency room, Rev. Chow felt ill and pulled over to the side on his way after a gathering on Yangmingshan in Taipei, the hospital said. Rev. Lyim Hong-tiong, General Secretary of PCT General Assembly, called PCT members and pastors to make an intercession to God for comforting his families and friends. Rev. Kao Chun-ming, former PCT General Secretary, expressed his deep sorrow and loss for learning the death of Rev. Chow. Rev. Kao especially pays tribute to Chow’s role as a true peace maker, when PCT declare “Public Statement On Our National Fate” (1971), for not only delivered his full support based on his faith but also agreed that Taiwan should stay in UN. Rev. Chow’s extraordinary courage to speak out truth and advise Christian values to KMT’s dictatorial leaders, Chiang Kai-shek and Chiang Ching-kuo, is also affirmed as “one of the true voices of Taiwan church” by many church leaders. In 1960s, Rev. 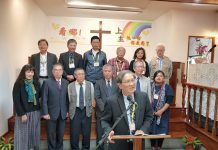 Chow was recognized as the most sympathetic church leader to support PCT’s engagement in ecumenical movement; Rev. Chow was also invited by PCT’s Rev. Shoki Coe and Rev. Hwang Wu-tong to promote ecumenical movement together and encourage more churches to join in. In 1990s, when the social movement of searching 228 truth and reconciliation was initiated, Rev. Chow and Rev. Won Hsiu-kon jointly hosted a commemorative service for peace. 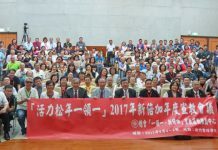 Striving to reach a mutual respect among different peoples in Taiwan, Rev. Chow used Taiwanese in his sermon and Rev. Won spoke mandarin to deliver his message. Both pastors gave up their fluent mother tongues and used the unfamiliar languages of their neighbors to symbolize inclusiveness and peace. Mr Won Tsuan-kien, President of Chinese Christian Literature Council(CCLC), described Rev. Chow’s contribution as a biblical scholar focusing on biblical interpretation from a stance of the Chinese people. In order to develop the Chinese theologies with local characteristics, Rev. Chow as a CCLC editor had started to invite biblical scholars from Taiwan, Hong Kong and South Eastern Asia to re-interprete the Bible from 1980s, says Mr Won.